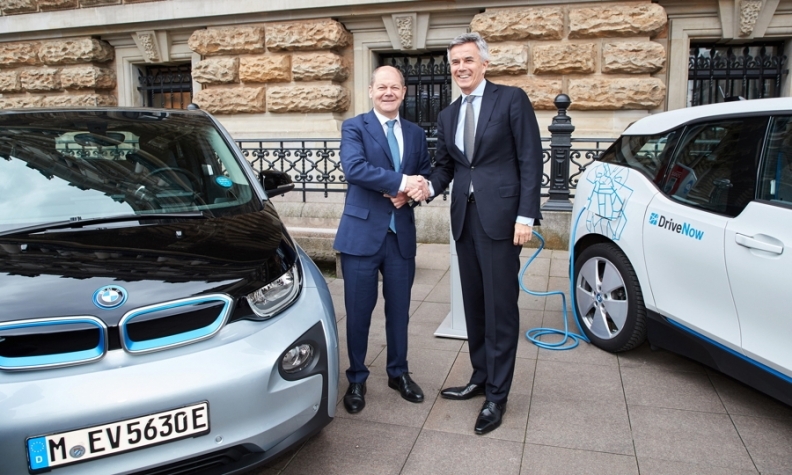 BMW Group Board Member Peter Schwarzenbauer, right, shakes hands with City of Hamburg Mayor Olaf Scholz after signing an agreement to expand Hamburg's fleet of electrified DriveNow vehicles to about 550 by 2019. In less than one week this spring, BMW Group and the city of Hamburg announced a landmark electromobility strategic partnership to stimulate advanced mobility. Mercedes-Benz said its plant in Rastatt would be its production hub for compact models from its EQ electric vehicle sub-brand. Meanwhile, Honda said it had opened Europe’s most advanced public electric vehicle charging station at its r&d center in Offenbach. In addition, China’s Beijing WKW Automotive Parts Co. said this year that it will invest as much as 1.13 billion euros ($1.24 billion) in an electric car factory in Rothenburg/Oberlausitz, near Germany’s border with Poland. The proposed plant would create more than 1,000 new jobs. WKW hopes to benefit from a Made in Germany label in marketing technologically advanced cars, Ministry spokesman Marco Henkel recently told Reuters. Automakers have spent billions investing in the country over the past few years, says Peter Fuss, senior partner and automotive specialist in Ernst & Young’s German practice. Fuss believes that collaboration between the auto industry and Germany’s politicians is growing as the industry’s challenges increase. “They understand that neither side can do it alone,” he says. But more will need to be done to enhance the German business landscape. “The changes need to happen even faster to defend against the growing number of rivals that are looking to create a place for themselves in the future mobility sector,” he says. in automotive manufacturing, that's more than 2 percent of the country’s active workforce, according to European industry association ACEA. The country that ranks second on ACEA’s list is France with 224,000 auto manufacturing jobs. German automotive workers also have a powerful union, IG Metall, and the country’s largest auto club, the ADAC, wields significant influence. Because of this, German automotive analyst Ferdinand Dudenhoeffer from the University of Duisburg-Essen's Center for Automotive Research said the country’s politicians keep a close eye on the industry. This story is part of the Automotive News GUIDE TO ECONOMIC DEVELOPMENT IN THE AUTO INDUSTRY. See more by clicking here.